In 1993’s Jurassic Park, Sam Neill’s character, paleontologist Alan Grant, sums up the allure of the concept, saying ” Dinosaurs and man, two species separated by 65 million years of evolution have just been suddenly thrown back into the mix together. How can we possibly have the slightest idea what to expect?” It’s both the fun and the horror of having a theme park full of previously extinct animals. While we have seen dinosaurs acting as both antagonists and agnostic forces of nature, we have never seen them working together in this franchise. This is half of the allure of Jurassic World, a film that is both exhilarating and attempting to prove that Jurassic Park was not a one-trick pony. Jurassic World gets us acclimated to the new, fully operational modern theme park through the eyes of two brothers, high schooler Zach (Nick Robinson) and elementary-aged Gary (Ty Simpkins). Their aunt, Claire (Bryce Dallas Howard) is the park’s operations manager, and the boys are treated to VIP passes. This modern theme park, built in defiance of the tragedy of the original park, feels very up to date, from the kinds of attractions on display to the amount of product placement slickly incorporated into the park’s offerings. Behind the scenes, Claire is working on the rollout of Jurassic World’s newest attraction, the Indominus Rex. It’s the first animal advertised as a completely new species, a Frankenstein’s monster created in a lab to spike attendance. The film seems to back this up, as there are just as many people clamoring to get a cell phone video of a Tyrannosaurus eating a goat as there are people checking their status updates while it happens. 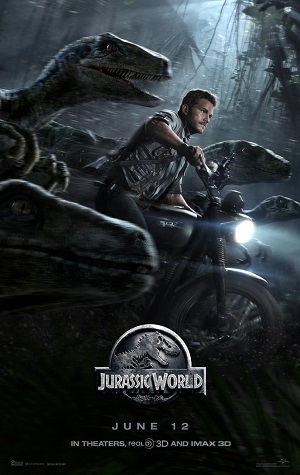 The Indominus’ creation does not sit well with Owen (Chris Pratt), an ex-Navy Velociraptor trainer. While he has forged a bond with a pack of raptors, this connection is tenuous at best, despite the wishes of Vic Hoskins (Vincent D’Onofrio) InGen’s head of security, who has other plans. And then all hell breaks loose, of course. 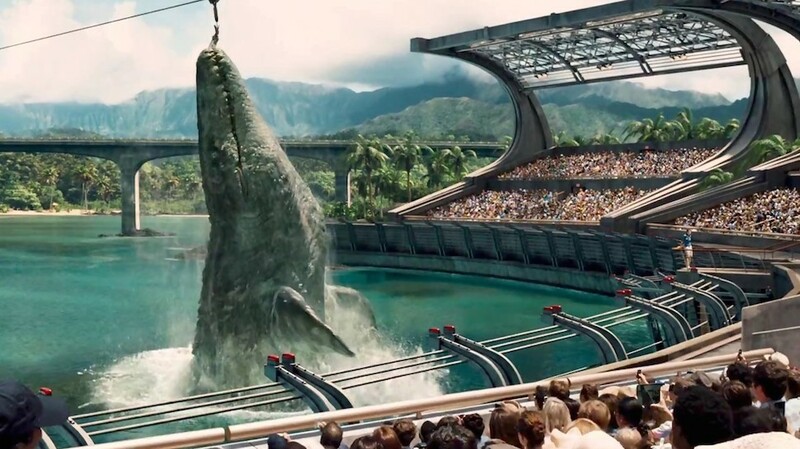 With its ‘theme park gone wrong’ preoccupation, Jurassic World is the most direct followup to Spielberg’s original, though on a much higher scale given the sheer amount of guests at the park. Everything here is escalated, making this film itself more of a thrill ride than the science-infatuated original film. For example, a set piece involving escaped pterosaurs attacking the theme park guests (a portion of which is featured in the trailer) is both fun and viscerally terrifying in a way that nearly matches the original classic. Throughout the film, the original park is lovingly referenced, both through visual cues and musically in Michael Giacchino’s score. 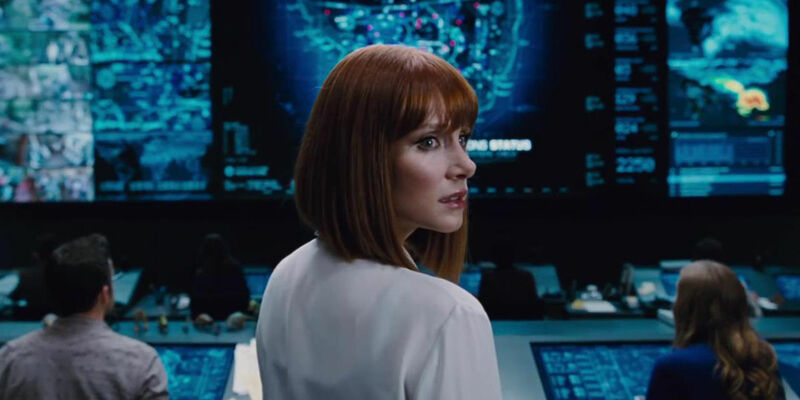 Even audiences now used to comic book stylings may find Jurassic World’s dialogue a bit heavy on the cheese factor, but at a certain point it becomes an endearing pleasure, especially since both Chris Pratt and Bryce Dallas Howard are game, and Vincent D’Onofrio chews through scenery like a hungry T. Rex. The unsung heroes of the film, however, are Jake Johnson and Lauren Lapkus, both workers in the park’s control room, conveying information back and forth and trying to wrap their brains around the disaster unfolding around them. While Jurassic World lacks the depth of the original film, it is a welcome continuation of the story. Rather than attempt to enlighten its audience with monologues about breaking scientific theories (though there is a very interesting thread about animals’ behavior when raised in captivity), it comments on the state of entertainment today. How far do we need to be pushed for a reaction? When everything is known instantly, how do we react to a mystery? Is there still time to be awestruck just by seeing something with our own eyes rather than through a phone screen? Jurassic World raises all these questions while showing that raptors are still scary some 22 years later. Jurassic World opens in Philly area theaters today.